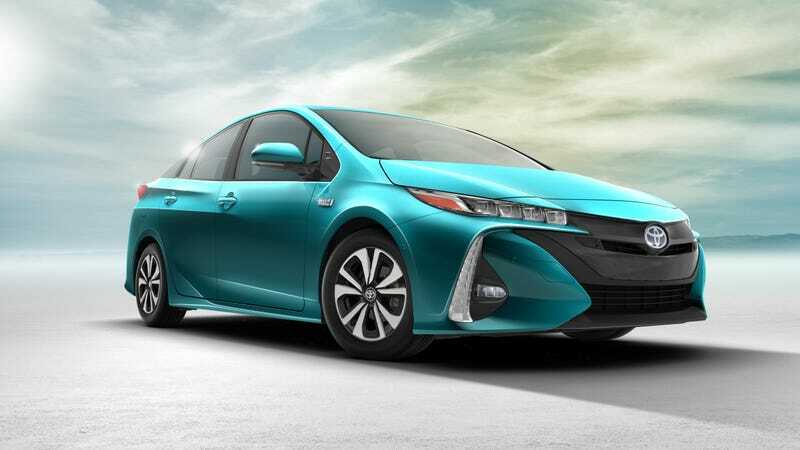 2017 Toyota Prius Prime: Will People Buy Toyota's Most Advanced Hybrid Ever? No, the 2017 Toyota Prius Prime doesn’t turn into a gigantic, fuel-efficient leader of the Autobots, like I was kind of hoping from the name. But it is Toyota’s most advanced hybrid ever: a plug-in with 22 miles of electric range. The question is, will people buy it? Before unveiling this thing at the New York Auto Show, the Toyota people themselves conceded that “light trucks” dominate the market currently, and with cheap gas and crazy low interest rates, they don’t expect that to change. So it’s hard out there for EVs and hybrids. Even the all-new Prius’ sales numbers aren’t that much better than the old one, though admittedly it’s on been on sale a couple months. But Toyota smartly knows this kind of thing is the future, so they aren’t slowing down with all the hybrids. The Prius Prime is the latest plug-in Prius, now with its own name and revised front and rear end. Oh, and its 8.8 kWh battery can be charged on a standard household outlet too, no fancy equipment required. That’s nice. Inside it’s very firmly taking aim at Tesla with a huge 11.6-inch tablet-style HD touch screen. It also does the automatic parking thing using ultrasonic wave sensors. Neat! This may not be the most mind-blowing enthusiast car ever, but it seems to be an impressive machine for what it’s supposed to be. Now, will people buy it, or will gas have to hit $6 a gallon before Toyota gets the last laugh?